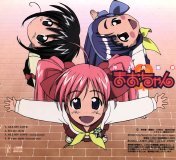 This CD contains the opening and endings songs to the TV anime Rikujou Boueitai Mao-chan. Songs by Horie Yui (堀江由衣). This CD comes in a foldout cardboard case.